Do you want your clients to view your practice as innovative with a high standard of client and patient care? Show them how advanced you are! Education is very important to your clients today, so address this need! Send them home with additional information in the form of an e-book so they don’t go home and ‘Google’ the information from another source. Show clients you’re serious about education and that you care about the outcomes of their pet. We are the owners of 4 Veterinary Clinics and a Veterinary Marketing and Branding business. We developed these applications for personal use in our own practices but so many people asked for them that we’ve put them on the iTunes Store so you can use them now too! Your subscription will help us continue to develop the apps and keep the information in the e-books updated. They’ve worked in our practices and they’ll work in yours too. The Veterinary iConsult will change the way you deliver pet health care in the consult room. 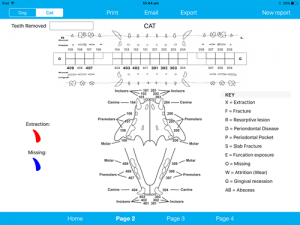 The iPad application allows you to show clients easy to understand diagrams, open an e-book of relevance to the health issue and email or print the e-book at the touch of a button. There is also an e-book section for nurses which is a great training tool for staff and a ‘value add’ for clients purchasing over the counter products e.g. tick prevention. The iConsult is also perfect for new graduates to ensure they are providing clients with a high level of education. The Pet Teeth Report is essential for showing clients the value of the service their pet received. This application has a full dental chart which you can highlight extracted and missing teeth for the pet owner. It also has the capability for you to take a before and after image! You can also note Resorptive lesions, Slab Fractures and Attrition on the dental chart to name just a few. The application is customisable so you can enter in all of your own recommendations and save them to the report so you don’t have to keep typing them out. 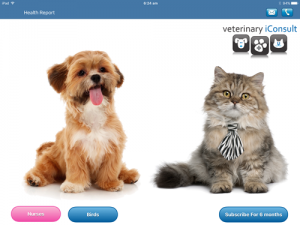 It also allows you to enter and store your veterinarians names and own messages for medications making it quick and easy to do up the report, ready for the client at discharge. There are also discharge or after care information on the form. The Pet Health Report should be used during every consultation to add value to your physical exams. It highlights to the client everything you checked in the full physical exam (weight, nose & throat, ears, mouth, teeth and gums, eyes, heart, lungs, neurological system, skin & coat, musculoskeletal system, abdomen, gastrointestinal system & urogenital system), The app also allows you to type in and store your personal recommendations e.g. flea control, vaccination, shampoo to name a few. Print the report to show the client value for your physical exam fee. Clients can also share the report card with family members at home. If you’re running short of time, print two copies and keep one for yourself so you don’t forget any details or recommendations when you type up your history at a later time. 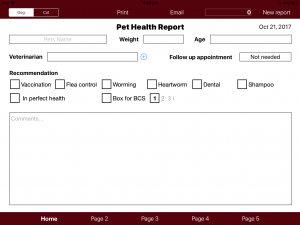 The iConsult Veterinary App is an absolutely fabulous tool both in consult to explain conditions to clients and after consults to send as e-books to clients so that the client and their family can read and understand about their pets condition, at their own lesiure. The e-books are very visual, with lots of diagrams and pictures and have an easy to understand text. There is no more photocopying of tired old handouts and so time and hence money and the environment are saved! We have been using iconsult for nearly a year now. We use it for nearly every consult and often phone calls and we absolutely love it. The clients love it too! We would thoroughly recommend it to anybody. iConsult has been a great addition to our practice. The e-books are relevant, concise and easy to read. We now know that the information our clients are reading is accurate and not from Dr Google. The diagrams are very helpful in explaining conditions to clients and the ability to email them an e-book right there and then makes life so easy! We also find that more clients book in procedures such as dentistry after we have used iConsult to describe the progression of dental disease and then emailed them the relevant information to discuss with their other half. I would highly recommend iConsult to any practice that wants to improve their client communication. Since implementing the iConsult, we have noticed how much faster and happier clients are to approve treatments or surgical procedures. We offered a great service before the iConsult but now I think we are unbeatable on service and value. It's a great feeling to constantly hear clients say how wonderful the iConsult is and how they've never seen it before. I hear 'Wow' a lot which is what we want! I'm not very computer literate either but have had absolutely no problem finding my way around the application. I would highly recommend it to any practice. I can honestly say it's one of the best things we've done for our practice and it's hard to imagine doing a consult without it now! After being an emergency veterinarian for 4 years I had to quickly relearn the fine art of educating clients when I returned back to general practice. It's been absolutely wonderful having the iConsult at my fingertips. I'm able to very easily explain conditions and clients are thrilled to have the e-books sent home to them. My nurses love the new nurse module too! Senior consults, weight consults and puppy consults are a breeze with the new module. I've also noticed that I don't have to work as hard to get clients to book in for surgery or accept blood tests. iConsult has been an excellent addition to the practice as I find clients understand their pet's condition more thoroughly after reading the e-books at home, allowing them to absorb the information more effectively. Clients really appreciate the interest you take in ensuring they understand the condition, and that you're not simply just "fitting them in" the 15 min you may have in consult. Not to mention the fact it makes explaining everything so much easier and more succinct! Thank-you iConsult! Just wanted to let you know how great the iConsult has been. It really adds value to the consultation and clients feel like they get something 'extra' that is waiting for them once they get home. It allows for more client involvement by informing the clients about the differentials and treatment options, which then enhances our follow ups and conversion rates. Amazing tool.